The crest on this monster's chest resembles Star and crescent. Before the ATK gauge appears, the star and crescent glows in this monster's crest. Whenever this monster is Summoned, a Riq track plays briefly. This card's damage effect could be a joke off of this monster being a Cat Dancer: Cats often scratch with their sharp claws, and very low damage it inflicts via its effect is sometimes referred to as scratch damage. 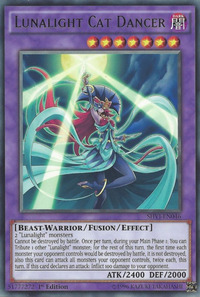 This monster's shadow appeared in the card artwork of Lunalight Serenade Dance. This card follows a four-stage evolution: Lunalight Cat Dancer > Lunalight Panther Dancer > Lunalight Leo Dancer > Lunalight Sabre Dancer".